If conquering new territories and scaling new heights is at the top of your agenda, then this getaway could be the destination of your dreams. 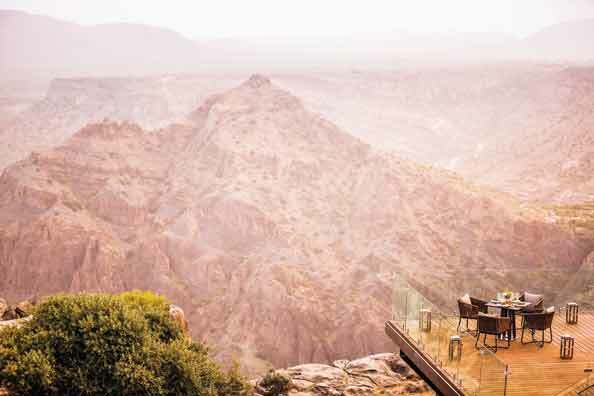 We’re giving one reader and their guest the chance to win a luxurious two-night stay at Anantara Al Jabal Al Akhdar Resort, the highest five star resort in the Middle East, situated 2,000 metres above sea level. A rare jewel in the rocky contours of the Sultanate of Oman’s vast Saiq Plateau, Anantara Hotels, Resorts & Spas’ latest opening is the place you’ve been looking for to find a slice of unadulterated tranquility. Surrounded by soaring mountains and peaceful gardens, the resort offers 115 luxury guest rooms and villas. You’ll stay in one of the Deluxe Canyon View rooms, with your mini break including breakfast, return airport transfers and the rare opportunity to take part in the ‘Three Village Tour’ offered by the resort. Guided by Omani mountain gurus, you’ll set off on a cultural adventure to discover the history behind the three villages of Al Aqr, Al Ayn and Ash Shirayjah. Pass through a medicinal distillery, mosques and traditional Omani houses – both abandoned and inhabited – as the guide fills you in on the area’s fascinating history along with intriguing details about local life. After a day of exploring, take private dining to new heights with the Dining by Design experience on the cliff’s edge – with your very own butler and chef. Alternatively, turn up the heat and join the chefs in the kitchen. The Spice Spoon Cooking Class allows guests to accompany chefs to the souks to pick out ingredients. End your trip on a high by checking yourself in to the resort’s world-acclaimed Anantara spa. With treatment rooms offering a combination of signature spa treatments and ancient hammam rituals, the spa’s philosophy is one of luxury combined with harnessing the essence of Arabia. We defy you not to feel rejuvenated after all of this.